A Picture - Serial of how the Electronics storage works , shown on the model . The seat is closing all openings afterwards. I had to rework the seat-mould a little bit to make electronics-storage easier . Pics of that Measurement will follow also soon . 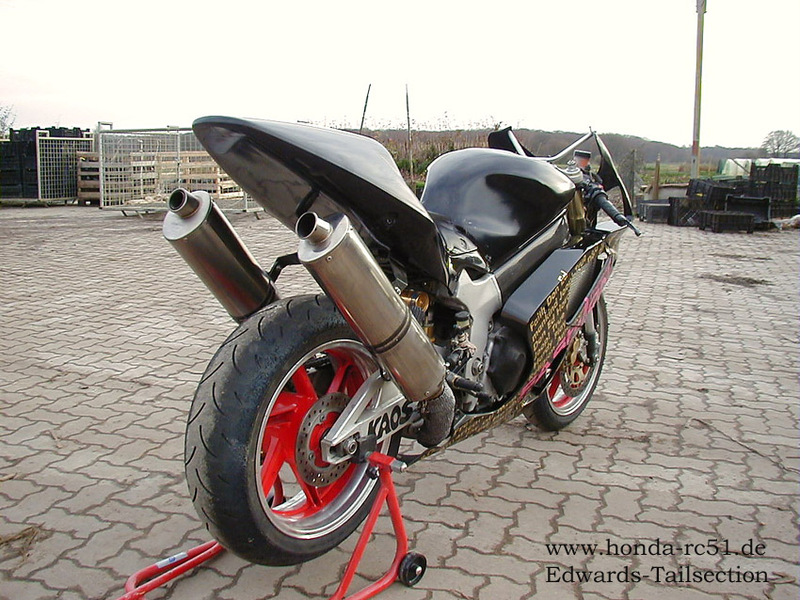 A few Details now about the Versions which will be available .All Edwards-Tailsection types are fully Carbon or Heavy duty Carbon + Carbon/Kevlar , for those who often high- or lowside .The Tailsection come in with a fine black gelcoat , which is able to be painted - or leave all as it is , black is a nice colour . 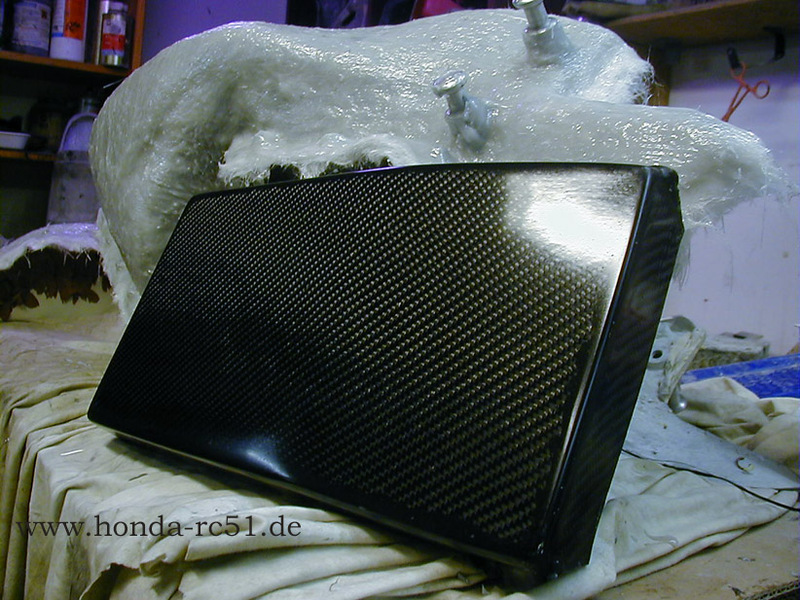 I : for all those who have anyway no electronics or only the ECU in the back , there is no need for a large Pan , so this would be the basic Factory-Tailsection . Because the undertail is closed and one with the Tailsection - so there are no screws showing out or similar - there are several ways for Taillights . Myself I always prefer a Carbon-Bracket where you can mount all the stuff like Taillight , #-Plate , Blinker and so on , which means once you go on track you simple remove all this stuff whit 4 screws, and you go on track with a full racing-Tailsection, where no Taillight is showing , that it is a Roadbike . I know that some would like to have a integrated Taillight , which is also possible to fab. November 9/2006 :At present I develope a lot of new stuff , but my capacities are limited . 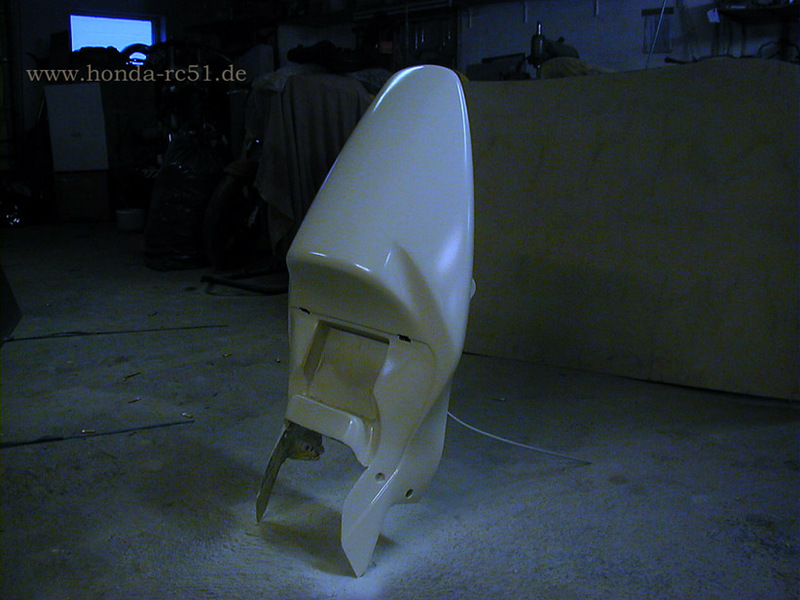 So - it is more kinda feeling - I am not so sure to be able to fab a lot of these Tailsections . 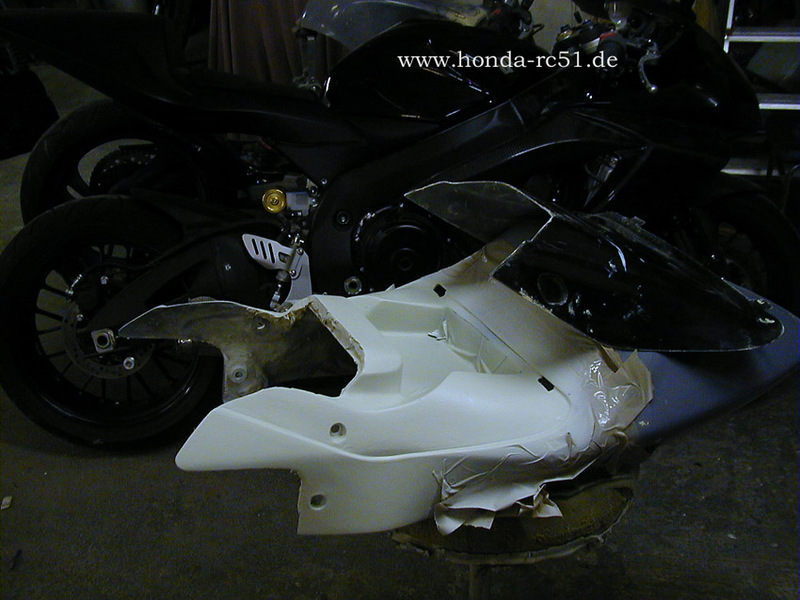 My Estimation is one a week ( it's a 3 to 4 pieces-Assy , Tailsection , Seat ,Pan for Electronics , #-Plate/Blinker Bracket ) . So please - if you like to order it - allow some Time for delivery. 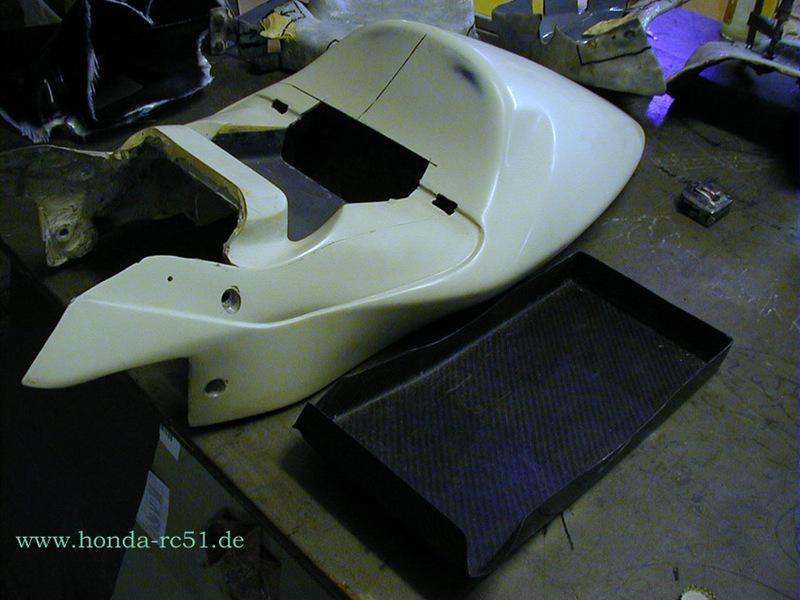 Tomorrow I will begin with the mould of the Edwards-Tailsection . Through all the different Parts the mould has (where each has to harden at least a day ) the mould takes 7 days , then demoulding of the model and preparation of the mould for positives takes another 2 days . So my countdown : In 14 days the Tailsection will appear here ! But tomorrow one more Picture of the modelwork here . The Pan to carry the Electronics is already done . Inside modelwork still , but I proceed . I count 14 days , then the mould is done . Working every day on it !! 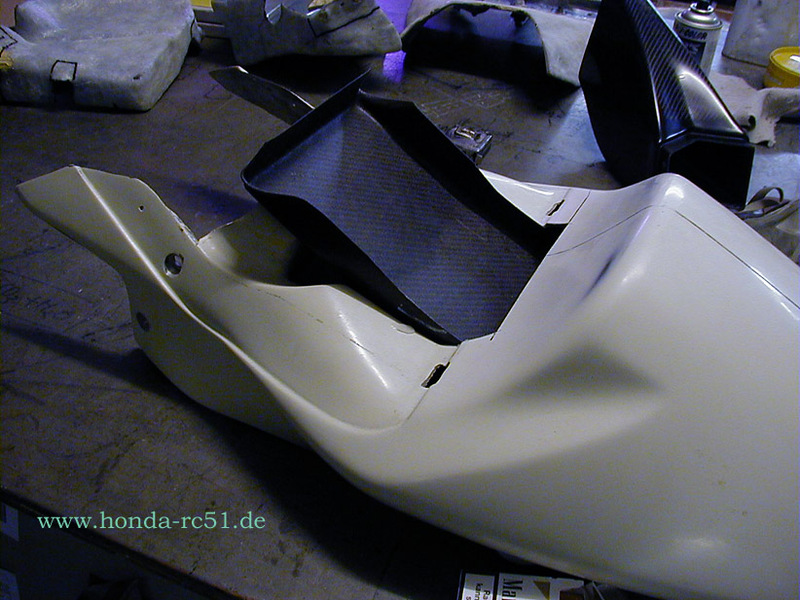 Got a sample RC from a friend here in Germany to have a close-to-OEM Bike to start to adapt the Edwards-Tailsection to a RC51 .What you see below in the end will be a Monocoque Tailsection , means : forget your subframe , it's no longer requiered . The Idea for a simple Tailsection for OEM Subframe as some kind of "bolt on" I layed on ice ,because -regarding the work involved , and the modifications I've got in mind - I thought it's better to put it all into this Tailsection . - is angled steeper than the Edwards and OEM one , which are at a height at the rear end of ~ 97 cm . 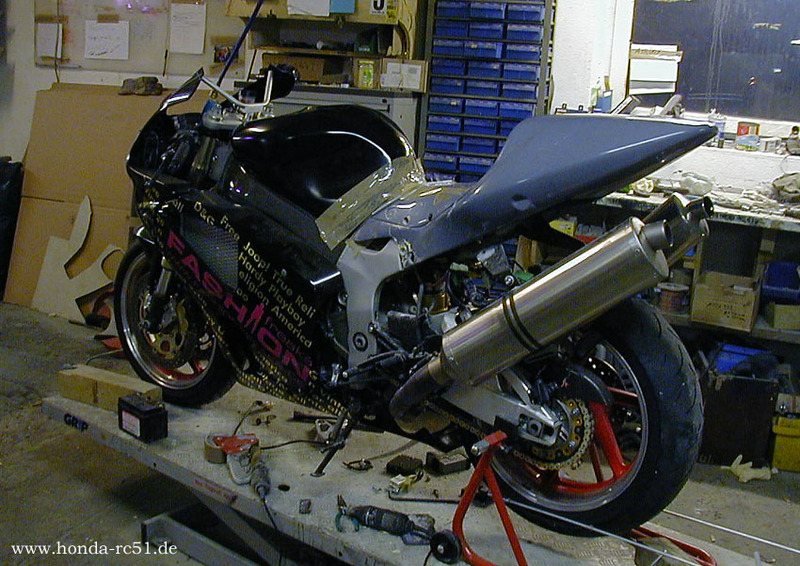 Sportbikes which I have measured are at a heigh of 102- 108 cm , and I've adjusted ~ 103 cm , so more than 2" more heigh at the end , Tailsection top is now matching the Fueltank-line much better . - is light . The weight-shaving is at it's Max . I'd estimate the weight-loose at 15 lbs , with exchange of only one component ! 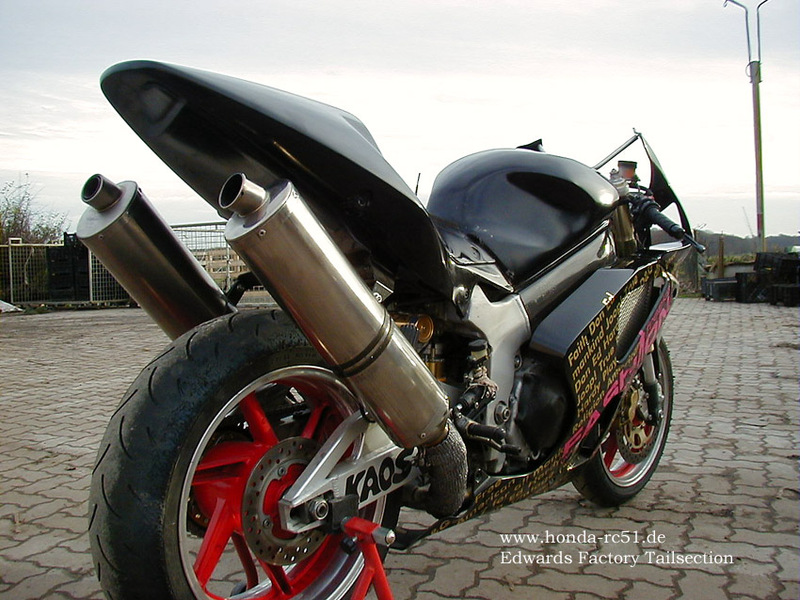 - is covering all kinds of Exhaust-Systems (as for mounting spots ) . 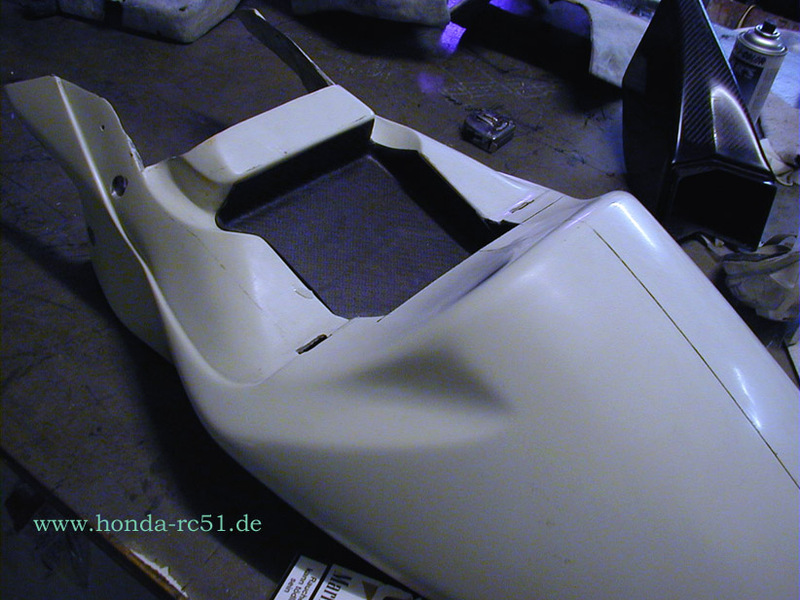 For high-mount theres the ideal spot integrated at the Edwards-Tailsection , and for all those which like to use the std.-spot I will reshape the inside of the Tailsection, that you can mount every hanger which has used the OEM Subframe Mounting-Spots !